The N24 started with 180 cars on the grid this year, but finished with much less as the night took its toll like always on this very tight circuit. Scuderia Cameron Glickenhaus had a bad start as well with the brand new SCG 003C, but kept on rocking to make history by crossing the line at #35. Wet, wetter, wall. The Nürburgring remains very much unforgiving, come rain or shine. The SCG 003C worked brilliantly - especially for a freshly developed race car - and survived the hours of darkness in the woods without needing even a duct tape treatment. The car was fast as well, reaching ninth position at some point and recording its best time yet at 8:26, but remained seven seconds slower than the quickest Audi before a three minute penalty for speed limit violation slowed it down significantly for the first time. After picking up the pace again and starting to catch up with the top ten, a standard Honda part gave up and almost two hours were lost as the idler arm bearing started to break belts and killed the alternator forcing a car to its first long pit stop. The error resurrected later on and killed off the power steering just to make things difficult, while at the pits, the SCG 000C’s exhausts started to act as flamethrowers as the broken system kept spraying oil into the hot turbos. The car remained well isolated from the flames thanks to its design, and a pair of CO2 fire extinguishers took care of the rest while the team went for another elbow deep operation. 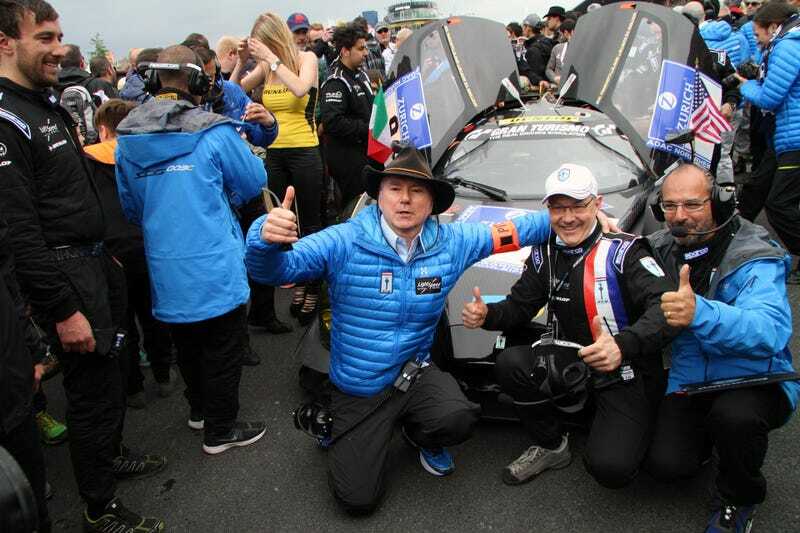 Power failures kept coming back from this point on, and while the SCG 003C was stuck at 30th position for almost the end of this 24 hour carnage, the next and final unplanned pit stop pushed the Glickenhaus team down by five positions in the last half an hour. She even had to be pushed in by the team to be able to complete that all important last lap. First overall was far away. Being in the top ten would have been possible if that bearing doesn’t mess up the picture that much. They lost three hours overall. Either way, surviving the night here is a massive achievement while completing the race with a brand new, self-built car is sub-zero cool and something you don’t see everyday. Or in every decade. Scuderia Cameron Glickenhaus, we salute you! As for winners Audi, congratulations, as always. I though BMW might get you this time, but of course not.